Aisuke Kondo is a Japanese contemporary artist based in Berlin. 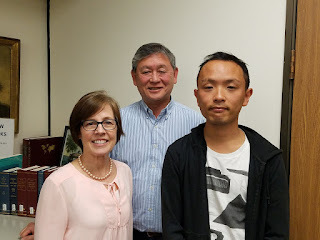 Recently, he spent some time at the California Genealogical Society (CGS) learning about his great grandfather, a Japanese immigrant who was incarcerated first at Santa Anita Assembly Center, and then Topaz War Relocation Authority Camp in Utah. Aisuke’s family history is compelling. His American-born grandfather was attending college in Japan when WWII broke out. He was conscripted into the Japanese Army and lost his American citizenship. Aisuke provided correspondence, documenting the efforts by his grandfather to have his citizenship reinstated. Sadly, the documentation also included letters from the U.S. government denying that request. 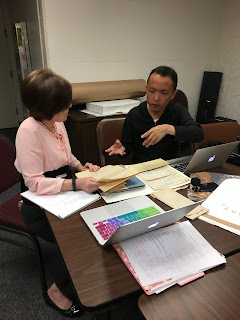 CGS President, Linda Okazaki, reviewed the documents in Aisuke's possession, and also made recommendations for further research. Ted Okazaki assisted with the nuanced translations related to the history of the time frame. There currently is an art exhibit in Los Angeles (closing May 28) that focuses on the incarceration Aisuke Kondo's great grandfather. 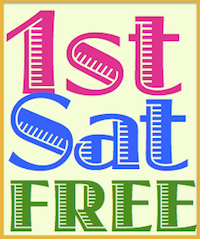 Whether your ancestors lived in California, Berlin, Japan, or someplace else, it’s always worth visiting the California Genealogical Society to make some ancestral discoveries.